Tantzt: The album begins with the popular synthesized techno style song composed and arranged by the legendary Israeli musician, Meir Adler. This is a very lebedik and enjoyable song. Yes I think it would be even more enjoyable with real instruments, but Yoely does this song justice. The choir by Shira Choir Dynamo, Zevi Fried adds a tremendous amount. Tizakeini: This hartzige and sweet song is the title track. Composed by Motty Illowitz and arranged by Moshe Laufer (no one adds horns to a song as well as he does) this is a very enjoyable song to listen to. Yoely Horowitz of Shira Choir leads the choir on this song. Haboitchim: Listen to the intro of this song and you’ll understand what I write above about Moshe Laufer’s utilization of horns in his arrangements. I love it (and the arrangements as a whole on this song for that matter!) This is a lebedik song composed by Pinky Weber with the choir once again by Yoely Horowitz. This is another enjoyable song. Sois Tasis: This is a rock ballad composed by Yitzy Waldner and arranged by Ruli Ezrachi. I love how the song starts out softly and simply and builds as the song progresses. This is also a song where Yoely’s range and the sweetness shine bright! U’v’yom Simchaschem: This is a Lipa Schmelczer style hora. Surprise…it is composed by Lipa himself too! Ruli Ezrachi’s arrangements add a Mediterranean style to the song. Vizocher: This extremely hartzige song composed by Pinky Weber starts off with a very heartfelt intro sung by Yoely. The arrangements by Moshe Laufer and the choir by Moishie Krausz really add to the somberness of the song. This song, which is 8 minutes long, is easily the longest song on the album. The strong somber feeling in the song changes at 5:49 to a very happy and upbeat song, which if you listen to the words is very apropos. The ending of the song shows off Yoely’s beautiful voice and range. Hatei: While I wouldn’t have followed up such a hartzige song with another slow song, this song has a little of an upbeat feeling to it. It is another song that shows off Yoely’s range and voice. 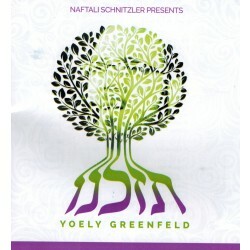 It is composed and arranged by producer Naftali Shnitzler and Yoely himself sings the backup vocals. I love the use of the flute in the intros. It is very underutilized (in my opinion of course) in the JM scene. Neshimu: This is another disco hora composed by Yitzy Waldner (he has a certain style to his disco horahs…) and arranged by Moshe Laufer (horns galore…which I love). Yoely Horowitz of Shira Choir leads the choir on this song as well. Chavivin: As I have mentioned before, the “oompah” style songs have become more popular recently. This song is another nice “oompah”. Composed and arranged by producer Naftali Shnitzler, this is a very enjoyable and melodious song. Once again on this song Yoely Horowitz of Shira Choir leads the choir and adds a lot to the song. Letoiva: This emotional and hartzige song composed by Naftali Shnitzler, arranged by Moshe Laufer, the choir is arranged by Moishie Krausz and with Yiddish lyrics by Lipa Schmeltzer sounds beautiful. Since I don’t speak or understand Yiddish I cannot really comment much more about the song. Shulom: Here is another synthesized techno style song composed and arranged by the legendary “One Man Band” and now band leader of the revolutionary band Sympinny, Pinny Ostreicher. It is a beautiful song and really lebedik. I still have my techno hang-ups but I am trying hard to get over it and this song might help!